Other researchers have challenged such criticism. Some have argued that the idea that the Allies took no action is a myth—that the Allies accepted as many German Jewish immigrants as the Nazis would allow—and that theoretical military action by the Allies, such as bombing the Auschwitz concentration camp, would have saved the lives of very few people. Others have said that the limited intelligence available to the Allies—who, as late as October 1944, did not know the locations of many of the Nazi death camps or the purposes of the various buildings within those camps they had identified—made precision bombing impossible. In three cases, entire countries resisted the deportation of their Jewish population during the Holocaust. In other countries, notable individuals or communities created resistance during the Holocaust. While the Allies were at war with Nazi Germany and engaged in a massive military campaign of unprecedented scale against it, they did little if anything to either stop the ongoing slaughter of millions of Jews and other minorities, or to save and absorb refugees. By 1938, some 450,000 of about 900,000 German Jews had fled Germany, mostly to British Mandate Palestine (a number which also included over 50,000 German Jews who had taken advantage of the Haavara, or "Transfer" Agreement between German Zionists and the Nazis), but British immigration quotas prevented many from migrating. In March 1938, Hitler annexed Austria and made the 200,000 Jews of Austria stateless refugees. In September, Britain and France granted Hitler the right to occupy the Sudetenland of Czechoslovakia, and in March 1939, Hitler occupied the remainder of the country, making a further 200,000 Jews stateless. In 1939, British policy as stated in its 1939 White Paper capped Jewish immigration to Palestine (then a British mandate) at 75,000 over the next five years, after which the country was to become an independent state. Britain had offered homes for Jewish immigrant children and proposed Kenya as a haven for Jews, but refused to back a Jewish state or facilitate Jewish settlement, contravening the terms of the League of Nations Mandate over Palestine. Before, during and after the war, the British government obstructed Jewish immigration to Mandatory Palestine so as to avoid a negative reaction from Palestinian Arabs. In the summer of 1941, however, Chaim Weizmann estimated that with the British ban on Jewish immigration, when the war was over, it would take two decades to get 1.5 million Jews to Palestine from Europe through clandestine immigration; David Ben-Gurion had originally believed 3 million could be brought in ten years. Thus Palestine it has been argued by at least one writer, once war had begun—could not have been the saviour of anything other than a small minority of those Jews murdered by the Nazis. A general strike organized on February 25, 1941 against the anti-Jewish measures and activities by the Nazis. By February 27, much of it had been suppressed by the German police. Although ultimately unsuccessful, it was still significant in that it was the first direct action against the Nazis' treatment of Jews. Norway and Denmark had a Jewish population of 10,000 between them. Acting on a Swedish offer of refuge, Denmark saved almost all its Jewish citizens, while Norway managed to save about half. After the liberation of the concentration camps, Sweden accepted thousands of survivors for medical treatment. Jews who were about to emigrate [… from Germany] had to obtain passports. At first, nothing in a passport indicated whether the bearer was a Jew. Apparently, no one thought of making any changes in passports issued to Jews or held by Jews until action was initiated by officials of a foreign country. That country was Switzerland. Of the five neutral countries of continental Europe, Switzerland has the distinction of being the only one to have promulgated a German antisemitic law. The country closed its French border to refugees for a period from 13 August 1942, and did not allow unfettered access to Jews seeking refuge until 12 July 1944. In 1942 the President of the Swiss Confederation, Philipp Etter as a member of the Geneva-based ICRC even persuaded the committee not to issue a condemnatory proclamation concerning German "attacks" against "certain categories of nationalities". 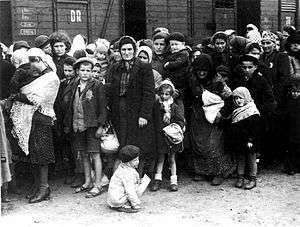 The United States also refused to grant temporary refuge to Jews fleeing Europe. In the wake of the Great Depression, the United States had a highly restrictive immigration quota system, but even the limited quota spots were not filled. The Department of State refused to fill 90% of the quota spots that might have been available for European Jews. In 998 press conferences, during more than a decade in office served wholly within the Nazi era, President Roosevelt never delivered the "appeal to the German people" regarding the Reich's treatment of Jews that he said he would. It was Treasury official Josiah DuBois who, risking his career, authored his celebrated "Report to the Secretary on the Acquiescence of this Government in the Murder of the Jews" that documented State Department efforts to thwart Jewish immigration from Europe. It was DuBois's report that furnished Treasury Secretary Morgenthau with the ammunition he needed to force Roosevelt into creating the War Refugee Board. Before, during and after World War II, The New York Times maintained a consistent policy to minimize reporting on the Holocaust. To this end, it placed such reportage deep inside its daily editions, while obscuring in those stories the special impact of the Nazis' crimes on Jews in particular. The Évian Conference was convened at the initiative of Franklin D. Roosevelt in July 1938 to discuss the problem of Jewish refugees. For ten days, from July 6 to July 15, delegates from thirty-two countries met at Évian-les-Bains, France. However, most western countries were reluctant to accept Jewish refugees, and the question was not resolved. The Dominican Republic was the only country willing to accept Jewish refugees—up to 100,000. The UK and the US met in Bermuda in April 1943 to discuss the issue of Jewish refugees who had been liberated by Allied forces and the Jews who remained in Nazi-occupied Europe. The Bermuda Conference led to no change in policy; the Americans would not change their immigration quotas to accept the refugees, and the British would not alter its immigration policy to permit them to enter Palestine. The failure of the Bermuda Conference prompted U.S. Secretary of the Treasury Henry Morgenthau, the only Jewish member of Franklin D. Roosevelt's cabinet, to publish a white paper entitled Report to the Secretary on the Acquiescence of this Government to the Murder of the Jews. This led to the creation of a new agency, the War Refugee Board. In November 1938, two weeks after Kristallnacht, United States Secretary of the Interior Harold L. Ickes proposed the use of Alaska as a "haven for Jewish refugees from Germany and other areas in Europe where the Jews are subjected to oppressive restrictions." Resettlement in Alaska would allow the refugees to bypass normal immigration quotas, because Alaska was a territory and not a state. That summer Ickes had toured Alaska and met with local officials to discuss improving the local economy and bolstering security in a territory viewed as vulnerable to Japanese attack. Ickes thought European Jews might be the solution. In his proposal, Ickes pointed out that 200 families from the dustbowl had settled in Alaska's Matanuska Valley. The plan was introduced as a bill by Senator William King (Utah) and Representative Franck Havenner (California), both Democrats. The Alaska proposal won the support of theologian Paul Tillich, the Federal Council of Churches and the American Friends Service Committee. But the plan won little support from American Jews, with the exception of the Labor Zionists of America. Most Jews agreed with Rabbi Stephen Wise, president of the American Jewish Congress, that adoption of the Alaska proposal would deliver "a wrong and hurtful impression...that Jews are taking over some part of the country for settlement." The plan was dealt a severe blow when Roosevelt told Ickes that he insisted on limiting the number of refugees to 10,000 a year for five years, and with a further restriction that Jews not make up more than 10% of the refugees. Roosevelt never mentioned the Alaska proposal in public, and without his support the plan died. The International Committee of the Red Cross did relatively little to save Jews during the Holocaust and discounted reports of the organized Nazi genocide, such as of the murder of Polish Jewish prisoners that took place at Lublin. At the time, the Red Cross justified its inaction by suggesting that aiding Jewish prisoners would harm its ability to help other Allied POWs. In addition, the Red Cross claimed that if it would take a major stance to improve the situation of those European Jews, the neutrality of Switzerland, where the International Red Cross was based, would be jeopardized. Today, the Red Cross acknowledges its passivity during the Holocaust and has apologized for this. In 1936, German-Japanese Pact was concluded between Nazi Germany and the Japan. However, on December 6, 1938, Japanese government made a decision of prohibiting the expulsion of the Jews in Japan, Manchukuo, and the rest of Japanese-occupied China. On December 31, Foreign Minister Yosuke Matsuoka told the Japanese Army and Navy to receive Jewish refugees from Nazi Germany. Diplomat Chiune Sugihara granted more than 2,000 transit visas and saved 6,000 Jewish refugees from Lithuania. General Hideki Tojo and Kiichiro Higuchi observed Japanese national policy as headquarters of the Kwantung Army against German oppositions. The pontificate of Pius XII coincided with the Second World War and the Nazi Holocaust, which saw the industrialized mass murder of millions of Jews and others by Adolf Hitler's Germany. Pius employed diplomacy to aid the victims of the Nazis during the war and, through directing his Church to provide discreet aid to Jews, saved thousands of lives. Pius maintained links to the German Resistance, and shared intelligence with the Allies. His strongest public condemnation of genocide was, however, considered inadequate by the Allied Powers, while the Nazis viewed him as an Allied sympathizer who had dishonoured his policy of Vatican neutrality. In Rome action was taken to save many Jews in Italy from deportation, including sheltering several hundred Jews in the catacombs of St. Peter's Basilica. In his Christmas addresses of 1941 and 1942, the pontiff was forceful on the topic but did not mention the Nazis by name. The Pope encouraged the bishops to speak out against the Nazi regime and to open the religious houses in their dioceses to hide Jews. At Christmas 1942, once evidence of the industrial slaughter of the Jews had emerged, he voiced concern at the murder of "hundreds of thousands" of "faultless" people because of their "nationality or race". Pius intervened to attempt to block Nazi deportations of Jews in various countries from 1942–1944. When 60,000 German soldiers and the Gestapo occupied Rome in 1943, thousands of Jews were hiding in churches, convents, rectories, the Vatican and the papal summer residence. On September 27, 1943, one of the Nazi commanders in Rome demanded that the Jewish community pay one hundred pounds of gold within thirty-six hours or three hundred Jews would be taken prisoner. When the Jewish Community Council was only able to gather only seventy pounds of gold, they turned to the Vatican. In his memoirs, the then-Chief Rabbi Zolli of Rome writes that he was sent to the Vatican where he was met by the Vatican treasurer and secretary of state who told him that the Holy Father himself (i.e., the Pope) had given orders for the deficit to be filled with gold taken from the Treasury." Despite the payment of the ransom 2,091 Jews were deported on October 16, 1943, and most of them died in Germany. Upon his death in 1958, Pius was praised emphatically by the Israeli Foreign Minister and other world leaders. But his insistence on Vatican neutrality and avoidance of naming the Nazis as the evildoers of the conflict became the foundation for contemporary and later criticisms from some quarters. Studies of the Vatican archives and international diplomatic correspondence continue. The international response to the war crimes of World War II and the Holocaust was to establish the Nuremberg international tribunal. Three major wartime powers, the US, USSR and Great Britain, agreed to punish those responsible. The trials brought human rights into the domain of global politics, redefined morality at the global level, and gave political currency to the concept of crimes against humanity, where individuals rather than governments were held accountable for war crimes. Towards the end of World War II, Raphael Lemkin, a lawyer of Polish-Jewish descent, aggressively pursued within the halls of the United Nations and the United States government the recognition of genocide as a crime. Largely due to his efforts and the support of his lobby, the United Nations was propelled into action. In response to Lemkin's arguments, the United Nations adopted the term in 1948 when it passed the "Prevention and Punishment of the Crime of Genocide". Many believe that the extermination of Jews during the Holocaust inspired the adoption of the Universal Declaration of Human Rights by the General Assembly of the United Nations in 1948. This view has been challenged by recent historical scholarship. One study has shown that the Nazi slaughter of Jews went entirely unmentioned during the drafting of the Universal Declaration at the United Nations, though those involved in the negotiations did not hesitate to name many other examples of Nazi human rights violations. Other historians have countered that the human rights activism of the delegate René Cassin of France, who received the Nobel Peace Prize in 1968 for his work on the Universal Declaration, was motivated in part by the death of many Jewish relatives in the Holocaust and his involvement in Jewish organisations providing aid to Holocaust survivors. ↑ Morse 1968; Power 2002; Wyman 1984. ↑ Segev 2000, p. 461. ↑ Hilberg 1995, pp. 257–58. ↑ Hilberg 1995, pp. 258. ↑ Hilberg 2003, p. 173. ↑ Hilberg 1995, p. 258. Excluding city-states, the five neutrals were Portugal, Spain, Sweden, Switzerland, and Turkey. ↑ Hilberg 1995, p. 259. As can be seen, the proclamation's description of Nazi crimes was vague, and would not even have explicitly mentioned the word Jews. ↑ Favez 1999, p. 88. ↑ Novick 1999, p. 2. ↑ Knickerbocker, H.R. (1941). Is Tomorrow Hitler's? 200 Questions On the Battle of Mankind. Reynal & Hitchcock. p. 363. ↑ Brazeal 2011, p. 58. ↑ Kennedy 1999, p. 796. ↑ Wyman 1984, p. 288. ↑ Brazeal 2011, p. 63. ↑ America and the Holocaust: Breckinridge Long, PBS. ↑ Medoff 2008, p. 6. ↑ Medoff 2008, pp. 40–52. ↑ Medoff 2008, p. 55, 64. ↑ Max Frankel (November 14, 2001). "Turning Away From the Holocaust". The New York Times. ↑ Leff 2005, p. 357. ↑ "Sosúa: A Refuge for Jews in the Dominican Republic" (PDF). Museum of Jewish Heritage. 8 January 2008. Retrieved 14 October 2012. ↑ Medoff, Rafael (April 2003). "The Allies' Refugee Conference—A 'Cruel Mockery'". David S. Wyman Institute for Holocaust Studies. Retrieved 14 October 2012. ↑ Penkower 1988, p. 112. ↑ Text of report, at website of TV show American Experience, a program shown on PBS. ↑ Raphael Medoff (November 16, 2007). "A Thanksgiving plan to save Europe's Jews". Jewish Standard. Retrieved 2007-11-25. ↑ Kizzia, Tom (19 May 1999). "Sanctuary: Alaska, the Nazis, and the Jews". Anchorage Daily News. Retrieved 14 October 2012. ↑ Bugnion, François (5 November 2002). "Dialogue with the past: the ICRC and the Nazi death camps". ICRC. Retrieved 14 October 2012. ↑ Goodman & Miyazawa 2000, p. 111. ↑ Goodman & Miyazawa 2000, pp. 111–12. ↑ Sugihara 2001, p. 87. ↑ Pfefferman, Noami (2 November 2000). "Sugihara's Mitzvah". JewishJournal.com. Retrieved 14 October 2012. ↑ Goodman & Miyazawa 2000, p. 113. ↑ Encyclopedia Britannica: "Reflections on the Holocaust"
↑ ""Encyclopedia Britannica: "Roman Catholicism" – the period of the world wars. ↑ Makinda 2005, p. 943. ↑ Winter, Jay and Antoine Prost. René Cassin and Human Rights: From the Great War to the Universal Declaration (Cambridge University Press, 2013), p. 346. Brazeal, Gregory (2011). "Bureaucracy and the U.S. Response to Mass Atrocity". National Security & Armed Conflict Law Review. 1 (1): 57–71. Cooper, John (2008). Raphael Lemkin and the Struggle for the Genocide Convention. Basingstoke: Palgrave Macmillan. Favez, Jean-Claude (1999). The Red Cross and the Holocaust. Cambridge, UK: Cambridge University Press. Goodman, David G.; Miyazawa, Masanori (2000). Jews in the Japanese Mind: The History and Uses of a Cultural Stereotype. Lexington Books. ——— (2003). The Destruction of the European Jews (3rd ed.). New Haven, CT: Yale University Press. Kennedy, David M. (1999). Freedom from Fear: The American People in Depression and War, 1929–1945. New York, NY: Oxford University Press. Kitchens, James H. (1994). "The Bombing of Auschwitz Re-examined". The Journal of Military History. 58 (2): 233–266. JSTOR 2944021. Leff, Laurel (2005). Buried by the Times: The Holocaust and America's Most Important Newspaper. New York, NY: Cambridge University Press. ISBN 0-521-81287-9. Makinda, Sam (2005). "Following postnational signs: the trail of human rights". Futures. 37 (9): 943–957. doi:10.1016/j.futures.2005.01.009. Medoff, Rafael (2008). Blowing the Whistle on Genocide: Josiah E. DuBois, Jr. and the Struggle for an American Response to the Holocaust. West Lafayette, IN: Purdue University Press. Morse, Arthur D. (1968). While Six Million Died: A Chronicle of American Apathy. New York, NY: Random House. Penkower, Monty Noam (1988). The Jews Were Expendable: Free World Diplomacy and the Holocaust. Detroit, MI: Wayne State University Press. Power, Samantha (2002). "A Problem from Hell": America and the Age of Genocide. New York, NY: Basic Books. Rubinstein, William D. (1997). The Myth of Rescue: Why the Democracies Could Not Have Saved More Jews from the Nazis. New York, NY: Routledge. Segev, Tom (2000). One Palestine, Complete: Jews and Arabs Under British Mandate. London: Little, Brown. Sugihara, Seishirō (2001). Chiune Sugihara and Japan's Foreign Ministry: Between Incompetence and Culpability, Part 2. Lanham, MD: University Press of America. Tokayer, Marvin; Swartz, Mary (2004). The Fugu Plan: The Untold Story Of The Japanese And The Jews During World War II. Gefen Publishing House; 1st Gefen Ed edition. Wyman, David S. (1984). The Abandonment of the Jews: America and the Holocaust. New York, NY: Pantheon Books. Rabbi Eliezer Melamed, The Great Democracies' Disgrace on Arutz Sheva.